CASSE’s ground-breaking community psychoanalytic approach to Aboriginal mental health is achieving positive outcomes. 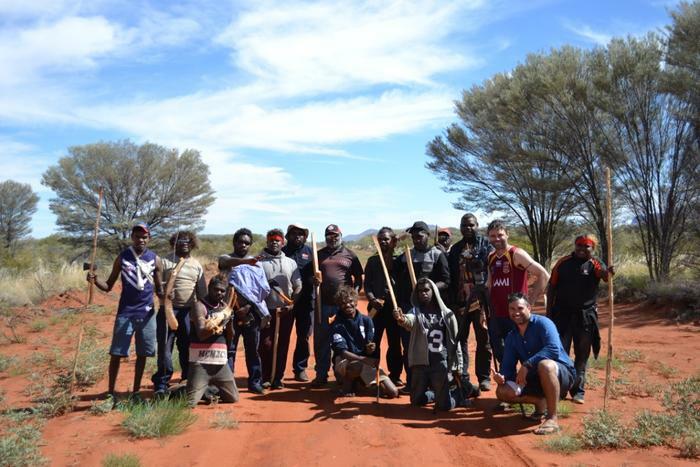 The Men’s Tjilirra Movement (MTM), facilitated by CASSE and in collaboration with the Royal Flying Doctor Service (RFDS), is leading cultural revival, changing minds and saving lives in the central western desert region of Australia by empowering men and communities to reconnect with their cultural practices in order to reconnect with each other. Ryan Liddle and the NITV team filmed a feature story about the inspiring men involved in this movement which premiered on ‘Living Black’ last week. Don’t panic if you missed it – it will be replayed on Living Black on SBS on Monday 6th March at 5pm. Following is the story about the MTM which is published on the NITV website. Western Desert culture has been alive in Central Australia for thousands of years. However it is at risk of fading away. Reconnecting elders with the younger generation is a key factor in stemming the tide, but it’s not quite that simple. Watch Ryan Liddle’s full report when it is repeated on Monday 6th March at 5pm on Living Black on SBS. Passed on generation to generation through song, dance, lore, ceremony and paintings, the Western Desert people have helped maintain Central Australia’s identity as a bastion of traditional cultural knowledge. The early frontier conflicts claimed scores of Aboriginal lives, people were often cruelly and violently dispersed and dispensed with as they came into contact with European settlers, pastoralists and Police. The last recorded massacre of Aboriginal Australians happened out here at Coniston in the late 1920’s, and it’s not far from memory for those from this region. The last stretch bitumen before the dirt road to the Western Desert. There was also pressure from missionaries for Aboriginal people to leave their bush life and to move into small communities known as missions, where they were often forced to adopt a foreign religion and language and urged to cease practising Indigenous customs. In many cases, this was the only way to survive. There were unforgiving and harsh government policies too, which ostracised and marginalised Indigenous communities and individuals and myriad other factors to deal with; droughts, welfare dependency, intergenerational trauma, disposition, substance abuse — the list goes on. You can see just how this culmination of factors plays out for some of the Aboriginal people of Central Australia first hand on a daily basis. The evidence is visible in many of the communities in and around my home town of Alice Springs or you can see it by simply looking up any number of statistics or news articles about Indigenous disadvantage, social issues like living standards, life expectancy and incarceration. With all these factors and with each generation, the links to that ancient pre European identity becomes harder and harder to hold onto. The breakdown in knowledge being passed from one generation to the next, as it has been done for millennia, is at dire risk of breaking down. In some parts of the country it already has. It’s the end of a hard day on the tool and the men’s group show off their wares. Martin Jugadai is a desert man through and through; he’s also a revered traditional healer, known in this part of the country as a Ngangkari. “Young people now are probably losing everything because of old people passing away,” says Martin Jugadai. It’s a special title reserved only for those who know certain old teachings. They have knowledge of special tools and powers and were traditionally trained to treat physical, mental and spiritual ailments. Healing modern afflictions like heart disease or diabetes might be a different story although many sufferers will still insist on traditional treatment in conjunction with western medicine. It’s probably safe to say that most Ngangkari’s weren’t taught how to save culture or language per se, but that’s exactly what Mr Jugadai has sought to do. The men are barely visible as they emerge from the Mulga scrub with their tools in hand. The Men’s Tjilirra Movement (TMTM) was born out of necessity. Martin Jugadai and other community elders wanted to make a change otherwise culture and ultimately identity would suffer. With help from the not for profit, philanthropic organisation Creating A Safe and Supportive Environment and the Royal Flying Doctor Service, they set about devising a program to stop the cultural breakdown. David Beveridge is a Senior Mental Health Clinician with the RFDS’ Remote Mental Health Team and says he realised that something was missing through his conversations with Elders. Men’s Tjilirra Movement participants enjoying the road trip in the back of the 4×4. Tjilirra is the name given to the practice of creating traditional Aboriginal tools. There is a strict cultural protocol where only men can make and use certain tools and implements. There is a fine art to creating these items; it was essential for survival and has been refined over thousands of years. You won’t find any power tools being used out here. Martin’s vision was to have a revival of Tjilirra, bringing community elders and young men together in the process. “I started the Tjillira Men’s movement for mental health, so I thought it would be best for young fella’s to do something like Tjillira to help make them strong. I’ve come a long way to get to a point where I have all those young fellas working with shield and boomerang,” he says. The foot tracks left in the soft sand are from a passenger passenger who was sent ahead to gauge the water depth and if it’s safe enough to pass. Opportunities, entertainment and meaningful employment are just some of the things that can be hard to come by in many of these communities. Jamie and his colleague Nathan Brown, with help from elders, organise trips with participant’s that often have them travelling by car, in convoys, to some of the most remote and harsh environments imaginable. As anyone will tell you that’s worked or lived in the region, organising trips of this nature and magnitude can be a logistical challenge. Adverse weather, cultural restrictions on travel and certain social interactions, large distances, sorry business and funerals and of course punctuality, can all make even the most patient person tap their feet in frustration, prior to departing. Just as patience is needed in Tjilirra, it’s also needed here. Suicide has recently spiked in the region so it’s imperative that as many participants as possible join in. “It’s about strengthening people through culture and how that will help reduce suicide rates and from what we’ve seen in our program it is immutable,” says CASSE Cultural consultant and Interpreter Nathan Brown. Tjilirra Patricipant Troy Miller says he and others jump at the chance to get away from community life that can sometimes become monotonous, especially when he wants something meaningful to do. The men enjoy a hot meal and a cup of tea as they share a yarn around a warm camp fire. The team rallies together before they load themselves and their supplies into the backs of muddied white Toyota troop carriers. Sometimes there will be three to four cars and groups of up to twenty or more. The cars are now as tall as houses. Every inch of room has been taken up. The roof racks are the last resort for space and they’re jam packed with swags, jerry cans, spare tyres and the essential desert camping accessory — vibrantly coloured mink blankets. “We feel something that is with us, the spirit and our Grandfathers too,” says Martin Jugadai. Once everyone is on board and accounted for it’s time to hit the road. They drive for what seems like hours over corrugated, water logged roads, occasionally stopping when a hunting opportunity arises, like a Kipara (Native Turkey) walking into sight or when someone has to get out to walk through the muddy water to test if it’s safe enough to risk crossing with the heavily laden cars. After a while the car stops, they have found what they are looking for: Acacia Aneura; the mulga Tree, a thick scrub full of it. Once the men disembark, it’s time to start. With shiny, freshly sharpened axes and tomahawks in hand, they walk in a jagged line through the shrubs and thick bush to find just the right tree for Tjilirra. With help and guidance from the elders and Jamie and Nathan, the young men get down to business. The early stages and beautiful colours of a Mulga boomerang. After a few hours on the tools they’re exhausted, but gratified and ready to make camp. Many of the men will keep their unfinished tools close at hand as the sun sets. Filing and chipping away until there’s just the light of the campfire to see. Wood chips and splinters fall at their feet next to running shoes that are red with dirt and that have probably seen better days. With styrofoam cups of hot tea in hand, it’s in this space that the elders talk to the men about the challenges they face; life, love, friendships, mental health, physical health, aspirations, culture; a whole gamut of issues that surround human existence and that make up who they are as individuals and as young Indigenous men. Watch the full report when it is repeated on Monday 6th March at 5pm on Living Black on SBS.